Today, I think was pretty productive. I mailed my Calculus book to Amazon for $105. I had bought it for $150ish. So net loss of $50 dollars or so, not bad at all. And! I finally put together my ideas for the Ride Concept Competition hosted by the Imagineering Disney Blog. The contest ends today, the 20th, so yeah I'm kind of on the late side. The worst part is that I follow that blog so I knew about the competition when they announced it roughly a month and a half ago. And it took me that long to put my ideas together since I had the idea, coincidentally enough, only several hours before I found out about the contest. So I guess I am deadline oriented after all. I need one to get stuff done. The ride is called The Unheimlichs' Soundwave. The Unheimlich brothers, as their surname suggest, are uncanny. They're also misnomers: Professor Liquid Unheimlich is on the stern and rigid side while Professor Solid Unheimlich is a go with the flow kind of guy. Together they are among the best professors in the field of audiology. They are continually nominated for teaching awards – occasionally, Professor Liquid will win one more award than his twin brother. But they wanted something more for their students. They wanted them to experience the unique properties of the sound wave. So they teamed up with Disney to imagineer a way to turn the invisible sound wave into a very visible coaster their students could experience. 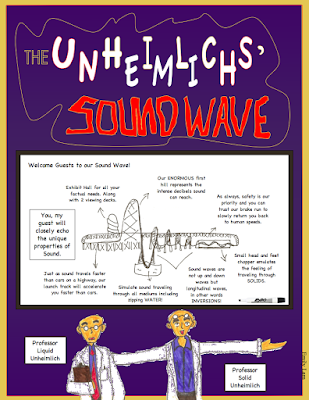 The Unheimlichs' Soundwave is the result of years of work and offers guests a way to simulate the unique properties of sound unlike any other experience. From a distance, guests can identify The Unheimlich's Soundwave, from it's unique appearance as giant waves. Right next to Test Track, The Unheimlichs' Soundwave lies on the edge of Epcot. The waiting queue circles the exhibit hall. And as guests wait in line, they have the opportunity to look into the exhibit hall and witness the latest audio facts, technology, and experiments. In line, they also get to meet the Unheimlichs in person and learn their story. Once aboard the coaster, guests are launched forward at transonic speeds rivaling actual speeds of sound into a enormous first hill that represents the high decibels sound can reach. At the bottom of the hill, guests zip through water demonstrating sounds ability to travel through all mediums, including water. Immediately after, guests are sent into four inversions that represent the longitudinal waves sound waves are made up of. During the homestretch, guests take on another medium sound travels through. They twist through a tunnel with very small head and feet choppers to emulate the rigid solid sounds travel through. After the ride, guests exist into the exhibit hall to further explore and purchase photos taken underwater of their experience traveling through water. Disclaimer: I do know a coaster will not reach the actual speed of sound, 768mph. But a coaster can reach 130mph. And with speeds that high, propaganda can spin it to sound "close" to the speed of sound. I also do realize that it's highly dangerous to zip through water, even for seconds. But that's for the Imagineers to figure out. This is just some blue-sky thinking. But I really do think it could be a possibility in the future. Maybe masks? Maybe just simulate the experience? Or Maybe something else. I included the disclaimer because some of the ideas are indeed blue sky. And I also included a flyer of some sorts with my entry. It's pretty simple because all I had to use to create it was Microsoft Word. I know, what kind of lame engineer to be I am. I will learn CAD soon though, don't worry. The flyer took several hours. And I don't know why the lab coats have spots on them. They're a fluke that I didn't think looked too bad and also made no effort to fix. Overall, I'm happy with my flyer. I really do like it. The color scheme fits well too. Tell me what you think.